Hot on the heels of the announcement of BMW's withdrawal from F1 comes the news that they will be honoring their commitment to give test drives to the winners of the Formula BMW series last year. Esteban Gutierrez won the European title and I wrote a slightly tongue-in-cheek article about him earlier this year; all I know about Gutierrez, apart from his success in Formula BMW, is the odd coincidence of his name with a line in a T.S. Eliot poem. I have seen Alexander Rossi race in the American Formula BMW series, however, and reiterate that he is something special. In the races I watched, he was head and shoulders above the competition, streaking away to wins that looked effortless. Like Gutierrez, he is very young to be considered a possible entrant to F1 as yet but, of all the up-and-coming names, his is the one to watch, in my opinion. Let USF1 find their feet in F1 next year and then perhaps we might see young Rossi in the game. It is good that BMW intends to let these young drivers have a go in their F1 car, as disappointing as its performance has been. It will be a chance for them to show how they might manage in the pressured and high tech world of F1, even though there is no longer any chance of them progressing from there to a test role with the team. Good luck to them both - I have something like a vested interest in their future success, having predicted such great things from them. 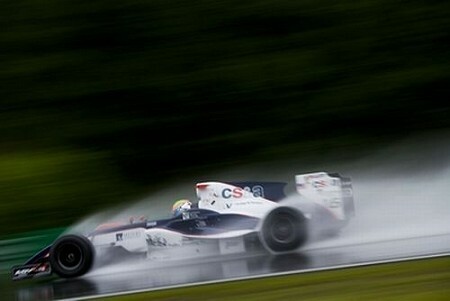 But the bad news is that BMW will terminate the Formula BMW Americas series at the end of 2009. The lack of support for what is a very good series is just further evidence of the parlous state of open wheel racing in America and the result is even fewer opportunities for young drivers to learn the skills of such racing. Unless F1 can establish a foothold there soon, the pool of talented American youngsters will dry up completely and make it almost impossible to rekindle interest in the sport amongst Statesiders. FOTA's prime goal should be at least one race in America next year and they can start with the return of the Montreal GP. I can't agree with you more regarding Rossi and the unfortunate loss of the BMW Americas series. Apparently North America is again the forgotten stepchild in open seater racing. I do applaud BMW's attempt to provide young western hemisphere drivers the opportunity to hone their skills in junior formula. It is truly a sad state of affairs here. One wonders if it will ever be truly fixed. I'm not hopefull. The return of Montreal---and not a minute too soon as far as I'm concerned. I see the Concorde agreement has been signed by 12 teams and Mosley. I was of the opinion one had to be of sound mind and body to sign binding, legal papers. Mosley has proved he is not, and anyone signing a binding agreement with a lunatic can't be firing on all cylinders either. It becomes obvious that the values of transparency, fairness, and respect of the fans are not high on the FIA or FOTA's priority list. We do get the governments we deserve! I think Brawn will serve as caveat emptor to anyone thinking that buying an F1 team is an investment. Without the staff and budget, an F1 car's "best before date" sneaks up awful quickly. For one (me) who is inclined to conspiracy theories, wouldn't it be easy control who is leading the championship by tweaking tire compounds in the favour of one team or another? The advantage/ disadvantage of the rubber monopoly combined with less than honest management. "...let's kill them all with a smile, so that we kind start again with good chromosomes". Nick: Looking on the bright side of the new Concorde Agreement, it does at least limit the power of the FIA president (no matter how insane) to fiddle with the rules of F1. Much of the political chaos that has occurred over the last few years has been as a result of the old agreement expiring and Mosley assuming the right to change things without consulting anyone. Stability in the regulations is now almost guaranteed and that has to be a good thing. As for the tyre theory, Bridgestone has favoured Ferrari with its compounds in the past but that was in the days when Michelin was still the competition. It suited them to design tyres for their best team and let their other customers adapt or die. But I think it is pushing things a bit far to suggest that the championship is being manipulated by the tyre company, with or without collusion from the FIA. To me, it seems that Bridgestone is rather bad at guessing which of their compounds will suit each track best and the fact that they have been getting it wrong so often has exaggerated the influence of tyres on the championship. The problem is really that, without competition, there is no incentive for Bridgestone to get the tyres right - they can just sit back and say, "These are the tyres we've brought and you can like it or lump it." The fact that Mosley is still part of the FIA reduces their credibility immeasurably. Any document with his signature on it can't be taken 100% seriously in my cynical opinion. The tires business is ridiculous. It changes what should be scientific into a lottery where we are asked to believe the process, despite the process being less than transparent. It also leaves opportunity for less than honest people to create an advantage. At this point in the ongoing evolution of F1 there is a great lack of credence in the honesty and fair play of the goings on within F1. When a team such as Brawn arrives at the top of things, to totally dominate, and then collapses, people are bound to wonder why. It is not beyond the FIA to weight the scales, as we know only too well. Now that the IRL system seem to have remembered who they are and shaken off some dust, they may yet restore proper interest from North Americans, but things aren't exactly perfect in Indy either. Concerning the tyres. To produce a tyre to suit one team and not another would have to cost more money than the low quality tyres there producing at the moment, and that`s were I feel the problem lies. Looking at the banded graining on Alonso`s rear right within 10 laps says says volumes. I think it`s a case of `Throw a few more elastic bands an carrier bags in the mix an sell for twice what we did last year`. The Teams are just lucky that there singing from the same Hymm sheet (Oh for a set of Michelins).